In other words, government expenditures have grown about as fast for the past two years as they did during the Bush administration’s final term. All the supposed tea party angst over spending and deficits is based on precisely nothing. Federal expenditures are about the same as they’ve always has been, while revenue has gone down and transfer payments have gone up because of the recession. 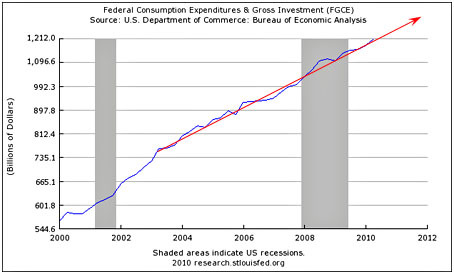 We have been adding to the deficit, but it’s because of the recession, not because spending has spiraled out of control. Another option is a radical increase in the standard deduction. I believe in bold yet, simple measures and so I don’t see a problem with increasing it by a factor of ten. This accomplishes several goals. First, it gets money into the hands of consumers. Its our helicopter drop. Second, it avoids any debate later over whether this should be the new tax structure. No one is going to suggest that a standard deduction of 100K should last forever. Now, doesn’t this run afoul of the permanent income hypothesis? If its temporary then people will save it, no? I am not so sure that the PIH holds in a recession like this. Unless we think that the massive phase shift we got in retail sales is because people suddenly downgraded their entire future income stream by 10% there is a scramble for liquidity going on here. This is precisely what we will help undo. Interesting! I don’t know if anyone has suggested this before, but it’s the first time I’ve heard it. I’m also not sure if it’s better or worse than a payroll tax holiday. Probably a bit worse, I think, since it wouldn’t be as progressive and wouldn’t get much money into the hands of the poor. If it were more politically palatable, however, I could live with it. But I don’t suppose it is. Republicans, after all, don’t really believe in the recession. They only believe in reductions on top marginal tax rates — aka tax cuts for the rich — and this certainly doesn’t accomplish that. So they’ll just go on pretending that it’s merely uncertainty over Obamacare among heartland small business owners that’s responsible for the weak economy, not deleveraging or foreclosures or disinflation or weak consumer demand. And so those small business owners will go on suffering.